While the common perception of school resource officers is that their job is to provide safety and security on campus, the officers themselves believe they serve another function that’s equally important; building relationships and being good role models for students. Delaware City Police Officers Larry Lucas and John Hartman maintain a presence at Dempsey Middle School and Hayes High School and give presentations at the elementary schools around the district. The officers teach classes and talk with students about a variety of issues, including health, legal issues, driving, self-defense, and safety. Hartman agreed and said he stands in front of Dempsey in the morning, greeting students and showing them that someone knows who they are and is happy to see them. “It’s about being a positive role model,” Hartman said. Lucas said sometimes their job can be challenging because of a student’s prior interaction or perception of police. Dan Bartha, the principal at Dempsey Middle School, said the school resource officers are an invaluable asset. Both officers said the biggest issue the face day to day involves social media. Hartman said social media is challenging because of how rapidly things can evolve and escalate. Lucas said that one of the major downsides of social media is how easily it enables bullies. Hartman and Lucas said they would conservatively estimate that 74 percent of issues they address have to do with social media. However, Lucas said that social media is not all bad and added that it’s a great way to learn about the climate and dynamic of the school. Hartman said he and Lucas have taken extra training to be adept at social media and said they constantly have to keep up with new platforms and trends. Bartha echoed Lucas and Hartman’s comments and said he and the staff are trying to instill in their students the importance of making good choices online because the consequences could be disastrous. “We try to be proactive in talking about how to use social media,” Bartha said. Bartha said he and Hartman are constantly talking to parents at Dempsey about being aware of what social media their children consume and take part in. “The best thing parents can do is be aware of whether their students is online and be aware of what they are putting out there and the longevity of those choices. Talk to your kids. You can sit back and complain or you can be proactive and learn about it,” he said. 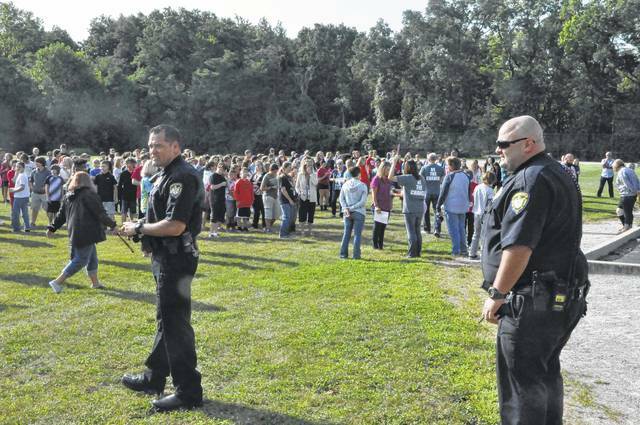 School Resource Officers Larry Lucas, left, and John Hartman, right, oversee a fire drill at Dempsey Middle School last Friday morning. The two men said in addition to providing security, they believe their job is to build good relationships with and be positive role models for students. This entry was tagged delaware city schools, delaware police officers. Bookmark the permalink.